I was early, so I pulled my white van into place behind the other vehicles in the school's "parent pick-up" line. And as I so often do, grabbed a book out of my bag to read. I'm almost finished Mary DeMuth's book, "Everything," which I think she wrote just for me (but that's a whole other blog post). Earlier that day I began to notice blogger friends unveiling their "one word 365" for 2013, which intrigued me. I had never heard of this project before. My mind began to turn its wheels. I wonder what my word for 2013 could be? It had turned into a busy day, so I didn't give it much more thought — until I began to read Mary's words. "Frederick William Robertson wrote, 'Human nature seems to need suffering to make it fit to be a blessing to the world.' When we suffer, we become effective here and bear fruit for the next life." (DeMuth, "Everything" 178). And in an instant I knew my word. Bear fruit. Fruit. Fruitful. I'm not entirely sure what God has planned for me this year. I like the many directions "fruitful" can take, beyond merely "producing good results," as the online dictionary states. 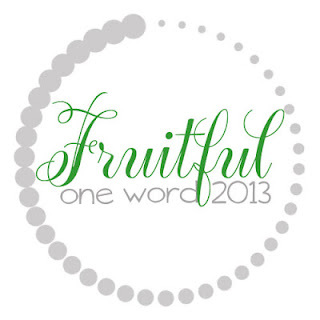 May "Fruitful 2013" be a reminder for me in all that I do, no matter what it is, that the fruit produced belongs to God (Leviticus 27:30). And as I have struggled with trust and self-dependence throughout my life, I must remain in Him because "no branch can bear fruit by itself. (I) can't bear fruit unless (I) remain joined to Him" (John 15:4). A special thanks to Melanie at Only A Breath for the special "one word" button. Me, too, Mandy! You were part of the inspiration for it! Thank you for your encouragement, Monica! And thank you so much for visiting! Wow, that's good stuff. To bear fruit, we must remain in Him. Love it! Thanks for the encouraging words! Thanks, Angela! Appreciate you stopping by! Love your word! Thanks for sharing! :-) God bless!